Perfectly natural reaction, I think, mr. anchovy. I have determined that occasionally I will put up a single painting or mural or section of a mural on the blog without comment. 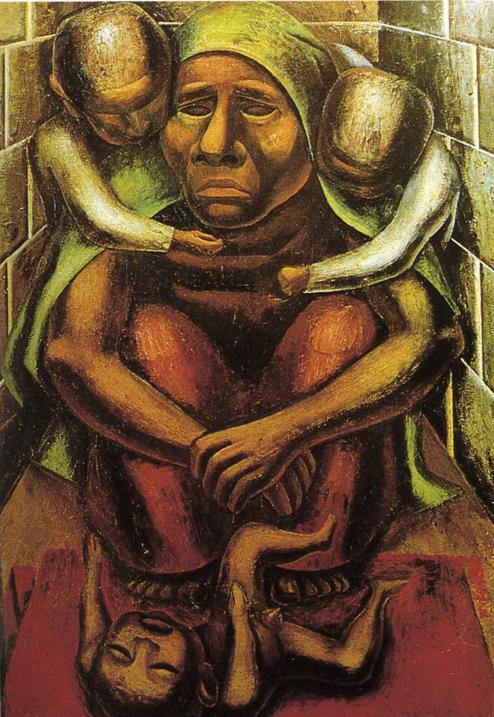 These will all be by one or another of the Big Three--Siqueiros, Orozco, or Rivera. Everyone should disregard the politics of these men. It truly does not make any difference whether or not one is repelled by people who hold political views on the far left. These paintings say something about the place, its history, and its culture far, far more profound than anything that can be said about the place in words by anyone, let alone me. Felicitously, these entries can also be easily disregarded by anyone not interested. Not much of an officionado of art but this makes me feel so sad. Quite a contrast to so many traditional paintings of mother and child, no? No sense of bounty or even intimacy...no energy to cuddle or hold the children. As in many mysterious paintings of women, we can see several interpretations. Is the caregiver of the working poor selfish refelcting a governemnt. A government is in idealistic beliefs supposed to care for the working people. A society has the people who run the society...and yet here they are weak...and the "mother" is unloving and miserly with her intimacy and caregiving. Or is this that the working peopel are beaten down and not self sufficent men but still clinging to an ideal of a mother. On many levels and interpretations it is sad. It is possibily more radical than it even first appears. And perhaps less "left" than we might expect. ...as it could be criticizing the ideals of the Communist notion of caring for the workers. Four Dinners, you do not need to be an aficionado in order to take something from these paintings that I will put up now and again. That is the real "beauty" of them, although few if any will be "beautiful" in the sense of "pretty." Wonderful comments these, Candy. Thank you. There is a bit of ambiguity about this one, is there not? The "meaning," for lack of better term, changes before your eyes as you look it. I thought this one might as well be titled Barefoot and Pregnant. Gee, I guess I was wayyyyy off with this. I immediately thought she had just given birth again and it was a miserable thing to have happen, and even the two older children seemed to realise rhis. Actually, my mind played out an entire story.. too many mouths to feed, too little to feed them. In what way, pray tell, were you wayyyyy off with this, Beej? I would say that you very well could be right on the money.